Microsoft has just released security updates and other updates for Microsoft Windows, Office, and other company products. The updates are available through automatic updating systems, update distribution systems, and also manual download. It is recommended that you read through our monthly overview of the Patch Day before you download and install any of the updates. Our overview includes information about all security updates, known issues, download links, and links to support articles that are useful when it comes to finding out more about certain updates released for systems and programs. Check out the January 2019 Patch Day here. Tip: Make sure you back up systems before you install updates, as updates may break things. Microsoft released security updates for all supported versions of Microsoft Windows. Microsoft released Servicing Stack Updates for supported versions of Windows. The Update Catalog lists 208 updates for February 2019. Windows Server 2008 R2: 24 vulnerabilities of which 3 are critical and 21 are important. Windows Server 2012 R2: 25 vulnerabilities of which 3 are critical and 23 are important. Windows Server 2016: 28 vulnerabilities of which 3 are critical and 25 are important. Windows Server 2019: 28 vulnerabilities of which 3 are critical and 25 are important. HTTP Strict Transport Security Preload gets top-level domain support in Microsoft Edge and IE11. Plus all in security-only rollup. Fixed an issue that prevented Microsoft Jet database files from opening. Fixed an issue that caused Microsoft Outlook search to fail. Fixed a file icon display issue in the taskbar. Fixed an issue the prevented the correct setting of the LmCompatibilityLevel value. Fixed the Microsoft JET database file access issue. Internet Explorer 11 layout recalculation optimization for server platforms. Added top-level domain support to HSTS Preload for Microsoft Edge and IE11. Fixed an issue that prevented Edge from connecting using an IP address. Fixed an issue in Microsoft HoloLens that allowed users to bypass the lock screen sign in process. KB4487019 -- Windows Server 2009 SP2 Security-only update. KB4487023 -- Windows Server 2009 SP2 Monthly Rollup update. Virtual Machines may fail to restore successfully after installing the update on AMD Bulldozer Family 15h, AMD Jaguar Family 16h, and AMD Puma Family 16h (second generation) architectures. Workaround: Shut down of virtual machines before restarting the host. Lenovo laptops with less than 8 GB of RAM may fail to start. Workaround: Disable Secure Boot on the PC. If BitLocker is installed, you may need to use BitLocker Recovery. The cluster service may fail to start after installing KB4467684. Workaround: Set Minimum Password Length policy to "less than or equal to 14 characters". SCVMM hosts may not be able to enumerate and manage logical switches deployed on the host. Workaround: Run mofcomp on Scvmmswitchportsettings.mof and VMMDHCPSvr.mof. Some users may not be able to pin web links on the Start menu or taskbar. Also, same local IP connecting issue as Windows 10 version 1809. Some users may not be able to load webpages using local IP addresses after installing KB4480116. Workaround: Add the local IP address to the list of sites in the Trusted Zone. You can read about the non-security Office updates released in February 2019 here. The list of security updates for Microsoft Office is available here. Windows security updates are distributed via Windows Update, WSUS, and other update management systems that Microsoft supports. We don't recommend that you run manual update checks as it may lead to the installation of beta updates or feature upgrades. Updates that Microsoft releases for supported versions of Windows are available on the Microsoft Update Catalog website as well. The links below lead directly to these downloads on the site. > Microsoft released Servicing Stack Updates for supported versions of Windows. Are you certain? Microsoft published Servicing Stack Updates for Win 10 v1607, 1703, 1709 and 1803. The first hour or so is always problematic as you may run into all kinds of caching or publishing delays or issues. Yep, thanks. Sorry for the misinformation. How about express updates for win2016 servers which were anounced to be reenabled in 2018 november. Am I only one who still can’t see these updates in WSUS and SCCM? Ah, time to roll the dice again. Thanks, Martin, For this monthly article hopefully Windows 10 version 1803 will soon automatically kick in to update, this month 29 vulnerabilities (from which 3 seem to be critical & also 26 who are important.). Every month I am thinking “Yet again a crazy high amounts of fixes again this month. 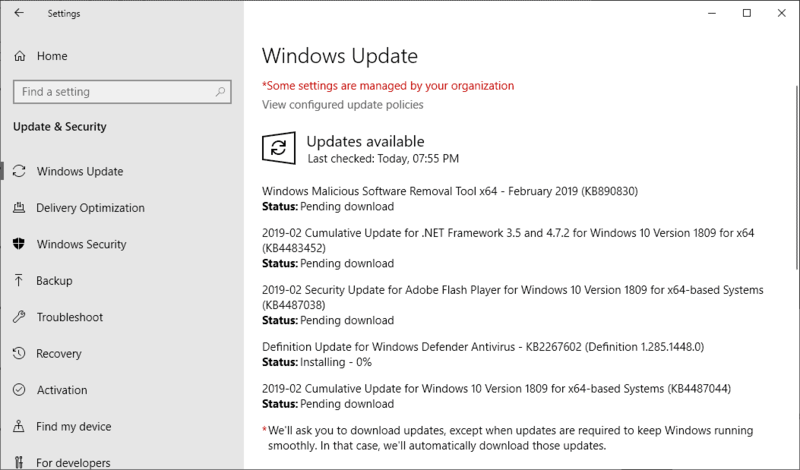 Title should really be: “Microsoft Windows Bugs Updates February 2019 overview”……. Thanks again Martin for the details. Whoa! I have set aside all of the Windows hard drives to my many LInux installs. 3 of these would need to be redone from before w7sp1 to resell with Windows. I guess they will go with Linux or be stripped & recycled. Does anyone know if this months updates include telemtry/diagnostics for Windows 7, I just got rid of all of them last month Thanks to an article here at Ghacks with a link to Tweakhound and don’t want anymore from Microsoft. I’m almost tempted to turn off Windows Updates early since there’s less than a year left and would if it wasn’t for Microsoft Security Essentials. KB4487085 for XP/POSReady 2009 is broken/incorrectly packaged with vista/7 files/components causing boot failures and other app crashes and must be uninstalled to regain functionality. KB4486463 for XP/POSReady 2009 is broken on uniprocessor/single core/non-HT installs causing looping repeat installs. We have found an issue with KB4487085 where you get a ‘The procedure entry point sprintf_s could not be located in the dynamic link library msvcrt.dll’ error, even though msvcrt.dll isn’t included in the update. You have to uninstall it to fix it. Made our helpdesk very busy this morning. whats the best way to uninstall about 800 PCs? this is affecting our machines. KB4487085 no longer shows on the AU yellow shield. Both KB4486563 (Win7 security monthly quality rollup) and KB4486474 (IE11 cumulative security update) broke our Centricity RIS software today; it’s a medical record system that runs inside IE11. If users click the “Tools” button inside the application, they immediately get kicked out back to the login page so none of the affected users could scan or view documents. The only fix I could find was to uninstall both updates, as uninstalling only one or the other wouldn’t fix it. Didn’t see any event viewer entries, either. Wish there was an easy way to tell MS about this but there’s no Windows 7 feedback hub. Are 1809 LTSC updates coming through WSUS yet? I have “LTSB” checked off and the only 1809 updates I see are .net FrameWork updates. No CU’s are coming through. Just did the latest Windows 7 update and now I do not have wireless capability on my laptop. Have done all of the suggestions I can find online and nothing has worked to restore the wifi. So now am doing a system restore to before the latest update. If it doesn’t work, I am really going to be frustrated more than I already am. I did uninstall the updates and restarted the laptop and still no wifi. It worked just fine until the laptop restarted after the update. Am I the only one? Update: I don’t know what did the trick, but I did a System Restore, deleted the adapters, restarted the computer, plus a couple other things again that I originally did, and was able to restore the wireless capability. Whew! I know just enough to get me into trouble, and sometimes out of trouble. My web application is not loading properly. I am browsing it using its IP. I have tried adding it up among Trusted site. Still doesn’t work. 4486474 appears to have stopped IE from rendering images with a backslash in the path in our legacy application. It is also saying on the Error Description: “Software update still detected as actionable after apply” in sccm status. As per checking on the machine, KB4486463 is already installed on it.